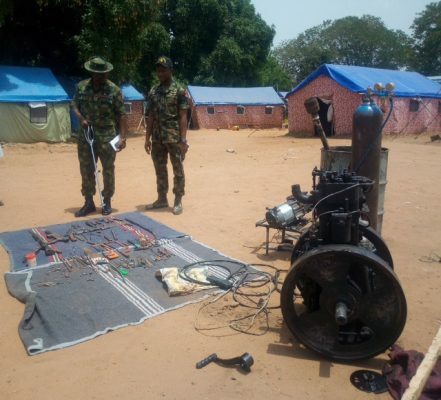 Troops of Operation Whirl Stroke (OPWS) in Benue state on Monday paraded a telecommunication engineer and one other person for allegedly manufacturing illegal weapons around the border community of Benue and Taraba states. The Force Commander of OPWS, Major General Adeyemi Yekini, told newsmen while parading the suspects at the Operations headquarters in NAF Tactical Command, Makurdi that the troop received information about the weapon manufacturers five weeks ago. Yekini said that after four weeks of intensive surveillance of the particular area in Aniyin in Logo local government area of Benue state, his men were able to identify the suspected culprits and then passed information to the troops of OPWS, Sector 2 led by Captain Samuel Okenarghe, who arrested two of the suspected arms dealers. Okenarghe told journalists that he led troops to locate the two suspects including the engineer who was later arrested on March 24, 2018 in Anyin with AK 47 and subsequently recovered other manufacturing items and several arms in different stages of completion from their illegal weapons’ factory. The Force Commander, Yekini, however added that the suspects were cooperating with OPWS as he emphasised that they already have a long list of their customers (suspects) who are spread across Benue and Taraba states. Meanwhile, the suspects; Engr. Cephas Ati and Mzunga Tseyina in an interview explained their roles in the alleged weapons’ manufacturing. Ati who spoke on behalf of his partner, narrated that he got involved in the illegal business two years ago after his return from Europe when his fortunes nose dived drastically occasioned by alleged witchcraft activities. “I had difficulties starting life all over again from scratch. Since I had ideas of arms manufacturing, having learnt it for five years in Mauritania, I decided to get involved in the business to raise money that would enable me go back to Europe,” he said. The suspect who claimed he is a qualified telecommunication engineer said he lives in Wukari in Taraba state (a border town of Anyin in Benue’s Logo LGA) but had on the day of his arrest visited his Anyin village on a dual mission; to deliver a simple rifle which a friend ordered for self defence and to check his farm under dispute by five of his brothers. Ati added that on the way to deliver the weapon, he had called Tseyina to drive him to the location, stressing that, that was the only involvement of his partner just as he denied owning any arms workshop in the area. He said the military apprehended him at his farm the following day while his five brother contended with him over the farm land and further alerted the troops that they were being threatened by their brother with an AK47. The suspect confessed to have engaged the owner of the workshop, one Tarveshima Uvande in Ukum LGA severally in the past two years to manufacture different rifles for him which he sold a total of at least 16 within the period to his customers for between N300, 000 and N350,000 per each rifle while pistols sold for N50, 000.